A popular professional CNC router, the AXYZ Series is suitable for one-off, small batch production as well as high volume and high productivity applications. Popular applications include: Signmaking - All types of 2D and 3D signs in woods, metals and plastics Metal Fabrication - Non-ferrous part manufacturing Plastic Fabrication - Engineering plastics, retail and point of sale Solid Surface - Process modern and traditional materials General Woodworking - Furniture, shopfitting, scenery production and more Graphics and Print Finishing - Cut-to-print using multiple tools for all materials Exhibition Stands - Large format routing for all requirements Scenery and Sets - Fast turnaround and high quality processing Foam Packaging - 2D and 3D processing with router and knife tools Interiors - Multi-purpose routing and engraving in all materials Point of Purchase - Display stands, fixtures and fittings At the Fablab we cater to a range of needs and offer a bespoke service to match most project requirements, please get in touch to discuss your CNC project. Can cut a range of materials including man-made woods, hardwoods, aluminum, foam, model board and plastics. How quick is the machine at cutting? 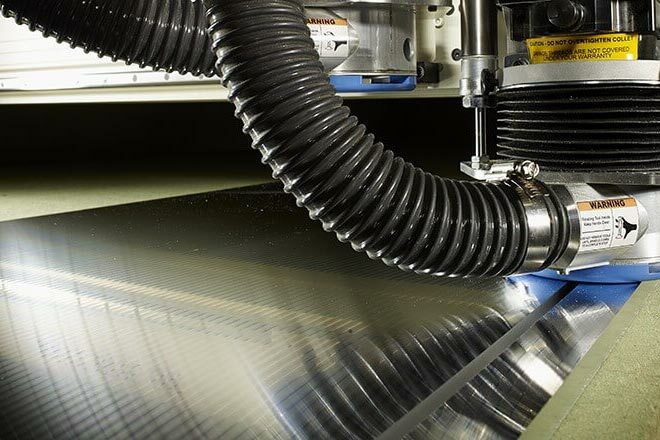 This is entirely depending on the material you are cutting, As a guideline something like MDF can be cut as fast 14 m/min whereas aluminum can be cut much faster than 2 m/min. What cutting bits do you have? We stock a range of carbide cutters, ranging from 2mm to 1/2inch in diameter. Can I use the CNC myself? At this time we can't offer member of the public inductions on the CNC machine, unless you have prior experience with the machine or want a bespoke training package, in which case please get in touch.